This year, MLK Day commemorations will coincide with the Presidential Inauguration, so the President is asking all citizens to join him in participating in a National Day of Service on Saturday, January 19. Earlier today, the Presidential Inaugural Committee announced that it will host a wide range of volunteering events in Washington, DC and around the country. Additionally, the Committee is encouraging people to pledge a commitment to serve after MLK Day throughout 2013. This Saturday, Michelle and I are heading out to events as part of the National Day of Service. It's a day to put politics aside, give back to our communities, and honor Dr. Martin Luther King Jr. by following his example. If we want to bring about change, it has to start with us, person by person and block by block. 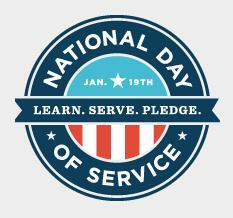 So today I'm asking all Americans to join me, and make a commitment to serve their communities - this weekend, and throughout 2013. Pledge to serve by adding your name here. I wanted service to be a big part of my inauguration because it's played a huge role in my life. As a young community organizer starting out in Chicago, I learned that the best ideas, the ones that succeed, take hold at the grassroots. No one needs to wait on politicians or Washington: Change happens when individuals take responsibility for one another and their communities. At the Day of Service in 2009, I visited with military families and wounded service members at the Walter Reed Medical Center and painted walls at a homeless shelter. Joe packed his toolbox and helped Habitat for Humanity hang drywall in new housing in D.C., while my girls, Michelle, and Dr. Jill Biden filled care packages for our troops overseas.